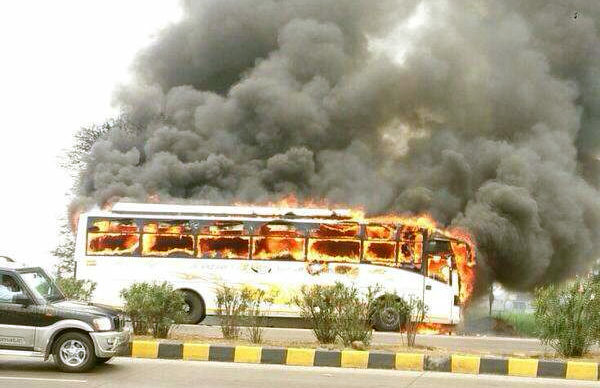 It was a horrifying incident for the Marwadi family from Belgaum who were on their way back to Belgaum from Pune when the bus they had hired on a contract basis of Shantadurga travels caught fire near Kini, Kolhapur on Saturday morning at 11.30 AM. The driver saw some smoke coming from the engine and immediately asked all the passenger to alight with their luggage and until the fire brigade arrived the bus was completely charred. The locals who were the first to come for help pour water on the fuel tank to prevent it from blasting. No one was seriously injured in the incident; however the exact cause of fire is yet to be ascertained the police said.